So glad you found these best day hike tips for how to get ready for a great day on the trail! The best day hike tips for beginners should be easy to understand. "I'd love to day hike but I have a wear (or where) question." "Sure, dayhiking sounds great, but where can I get good hiking gear without breaking the bank?" I encourage you to fill in your "but(s)" here. You want to start hiking. No need to stay trapped within your "buts". We're going to use REI Co-op as our trusted source for information and gear as we go through the best day hike tips to smash through your buts. 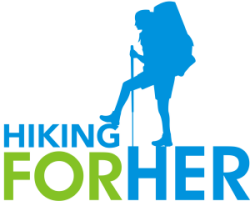 Full disclosure: As an REI affiliate and decades long fan of REI gear, Hiking For Her receives a small percentage of your purchase price when you use the links on this website. There is no extra cost to you. And because HFH recommends only what is used and trusted on the trail with great results, you're getting the best day hike tips for choosing gear and outdoor clothing from REI. And that makes you ready to hit the trail in comfort and safety. Did you also know about the member rewards you enjoy as an REI member? But (there's that word again!) did you also know that getting ready for a day hike is both an art and a science? Let's get off to a great st(art). What does art have to do with dayhiking? The art of day hiking includes knowing how to finesse your way onto a trail with grace and ease. And the art of having just what you need in your day pack - and not one ounce or gram more - will make you the envy of your trail buddies. Here's exactly what you need to make that happen. As you're learning the art of hiking, think of the trail as your canvas. So where are your paint brushes? Economize on everything else you'll need as a beginner hiker, and spend the most money on the best hiking boots or trail shoes you can find. Keeping your feet in top shape will pay dividends into the future. And just like an artist, once you fully commit to your art you'll need several different types of brushes trail footwear. Don't be surprised when several types of hiking boots AND trail shoes find their way into your gear locker. Sock choices abound, and here's where you're going to have to decide on brand loyalty versus shopping around. But how do I decide where to go? Let's return to the art of hiking analogy. Your paintbrushes (boots) need a canvas (trail). Or, as we hikers like to call it, a day hike bucket list, version 1. Visit the US Forest Service website. Select where your hiking plans are, by state. Select a forest from the list of tantalizing options. Look for the day hiking links. Cut and paste, or make notes in your trail journal. The US National Park Service offers a similar approach. Get started here by selecting a state to explore. Next order of business: using a little science razzle dazzle to tackle some more of those stubborn "buts". As a scientist AND hiker, I'm all about crafting the best day hike tips using facts and figures. Logic dictates that we start with not getting lost. You've selected a few trails, now it's time to consult a few maps before you get to the trail head. You've got two map options, both with pros and cons to consider. REI's map selection makes it easy to figure out the nitty gritty of day hiking options near you. Or daydream about an area you'd love to explore on your next vacation, semester break, or long weekend. Dozens and dozens of paper map options! The trick to a great day hike is to match your distance, time, and terrain choices to your current level of fitness. As you fit day hiking into your weekly schedule more and more often, your fitness (endurance and stamina) will improve. So don't beat yourself up, or wear yourself down, with first time, overly ambitious hiking plans that make you regret putting on your boots. And know that it's okay to plan a day hike - but not finish it. Build up to the challenging distance and terrain you aspire to, while staying safe and healthy as you learn. Why risk losing your new found appetite for hiking? It's easy to spot the connection between navigation and science. All that math, right? Yet serious science underlies the gear and clothing you want to use as a day hiker. If that sounds seriously boring, don't worry. We'll skip the techie details and dive right into what you need to wear to make your day hikes enjoyable. And while we're at it, a science based news flash for you. Yet as well designed as you are for day hiking, it just makes sense to give yourself an additional edge by wearing well designed athletic clothing. There are every day fabrics you can wear for outdoor clothing on warm, sunny days. Cotton T shirts come to mind. But not for you, dear day hiker. You want to wear the highly engineered fabrics designed for hikers who don't wait around for ideal weather conditions. There's no need to go overboard on a new hiking wardrobe when you're starting out as a day hiker, but you certainly don't want to pass up a chance to stay as dry, temperature regulated, and comfortable as possible. Now let's use science based facts to stay fueled up! Because you're leaving the refrigerator behind, you need to be strategic about your food choices for a day hike. Food calories are muscle fuel, and you want need to make every bite count. Carbohydrates (carbs) are the name of the game. Best part about this list? You save 10% off your REI order when you purchase 10 or more of these performance foods. Which is easy to do, because you're going to get really hungry on your day hikes. You'll also notice an increased appetite for 24 hours or so after your hike, so plan accordingly. It's good practice to bring along extra food no matter how short or easy you made your hiking plan. 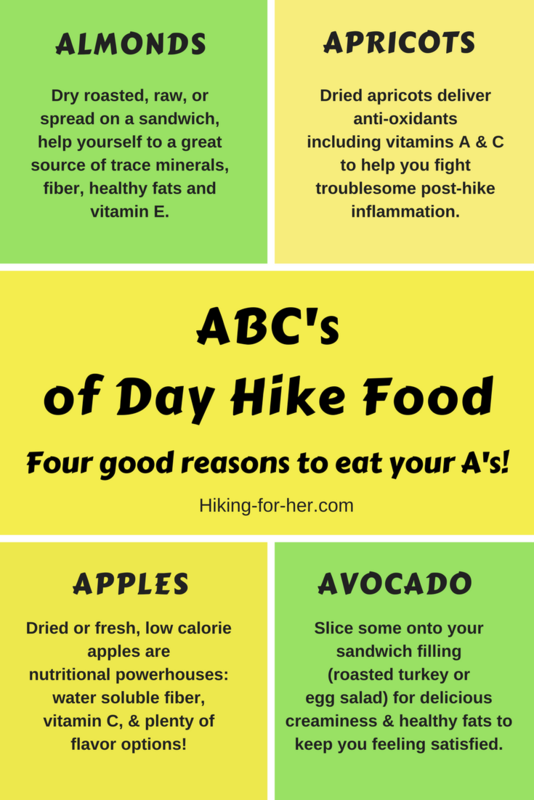 Click on this infographic for more easy-as-ABC day hike food ideas. Water is a nutrient, and a very important one for a day hiker. Your thirst level on a day hike might seem weirdly low when you compare it to the amount of effort you're exerting. You're distracted by the new experience of tracking mileage and consulting maps. You are having way too much fun to think about stopping for a rest & rehydration break. Unfortunately, ignoring your thirst sensation can cause your energy level to drop precipitously, making it tough to get back to the trail head with your dignity intact. Either way you go, don't wait for a thirst sensation to grab your attention. Drink early and often along the trail. Water is one of your best insurance policies for continued high energy on your hike, along with those high carb snacks already mentioned. Tips for eliminating these show stoppers coming soon! What if your "buts" aren't on this list? Write to me using this CONTACT link, and together we'll do some "but busting". It pains me to think of you NOT day hiking because you don't have answers to your day hiking questions. I can rustle up some of the best day hike tips just for you, and then you can take it from there. Soon, the art and science of day hiking will be second nature to you, and what a great feeling that will be! And as long as you're here, dip into a few more beginner hiking tips to shorten that learning curve even more. You already know way more than a lot of day hikers just starting out - because you took the time to search for some of the best day hike tips. Concentrate on just two things. Get those right, and you'll enjoy your trail time. Add in water, the right hiking clothes and maps, and you'll stay safe, too. To streamline things even more for you, REI Co-op has created a comprehensive free pdf day hike checklist. You don't need to own everything on this list in order to get started, though. Stick to the basics we just outlined for your first hiking season. Use the green search box at the top of this page to find detailed advice about anything on this list. Pop in a search term, and presto! the best day hike tips to get you trail ready appear before you. To jet back up to the top where the box lives, use that blue TOP button to your right!